Goodwill Easter Seals Miami Valley has selected the University of Dayton's Dining Services as Employer of the Year for 2017 for supporting Goodwill Easter Seals Miami Valley's work to empower individuals with disabilities and other disadvantages to achieve independence. Dining Services staff will receive the award Friday, Aug. 4, as part of the Friday night concert series at the Fraze Pavilion in Kettering. Dining Services provides shorter-term, transitional employment opportunities for adults participating in Goodwill Easter Seals Miami Valley’s Miracle Clubhouse, a community-based program that helps adults recover from mental illness through consistent employment and other support services. Clubhouse members have the opportunity to obtain permanent employment with Dining Services if they successfully complete a 6-to-9 month transitional period. Bramlage noted statistics from Clubhouse International that show close to 80-90 percent of adults with severe mental illness are chronically unemployed, due in part to stigma and lack of services and supports — obstacles the Clubhouse model help members overcome. Dining Services employs more than 200 individuals in positions ranging from dishwashers to executive chefs within its 13 operations. 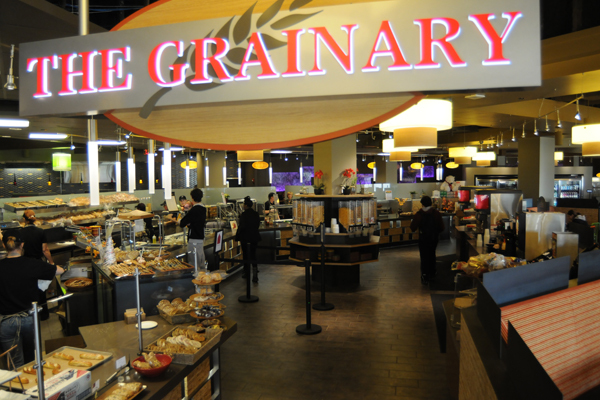 Dining Services’ multiple locations across campus are all exclusively à la carte. In addition to Au Bon Pain, Kennedy Union will feature three new micro restaurants — 'Que, Spice, and Toss — when renovations are completed in mid-August. The Grainary and Passport restaurants are located in Virginia W. Kettering; Marycrest Complex has a full-service dining room as well. The Emporium is a mini grocery store with a full-service deli located in Marianist Hall.